This book is a must have for special educators and school administrators! Inside you’ll find first-hand accounts of the major policy stakeholders involved in the reauthorization process. The author’s meticulous research and his unique, comprehensive approach to writing promotes an easy grasp of the nature and effects of the policy process that led to the IDEA discipline amendments. 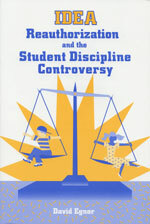 The author begins the text by exploring the origins of the discipline controversy and moves into a discussion of the history and process of the latest IDEA reauthorization. He also examines current effects of the policy and provides a valuable analytic framework for anticipating, understanding, and resolving conflicts associated with future reauthorizations. This book incorporates several years of history, interviews, and analysis and will certainly prove useful for anyone in the Special Education field.